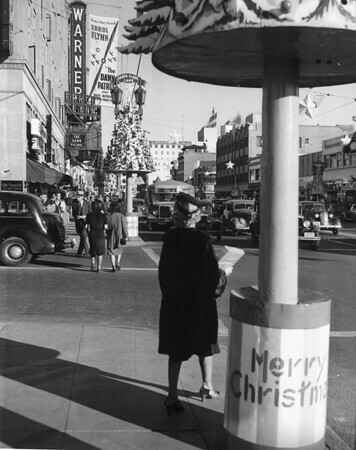 Photograph of Hollywood Boulevard at Christmas time, with the Warner Hollywood Theatre playing "The Dawn Patrol" with Errol Flynn, Los Angeles, December ca.1938-1939. Other visible businesses include: The Broadway Hollywood, Owl Drug Company, Eddie Fitzpatrick Cut Rate Drugs (Eddie Frederick Drugs? ).